All legislation starts off as an idea. These ideas can come from anybody and the process begins when either an individual or group persuades a Member of the Legislature to author a bill. The Member then sends the idea and the language for the bill to the Legislative Counsel’s Office, where it is drafted into the actual bill. 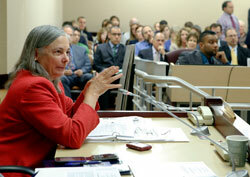 The drafted bill is returned to the legislator for his or her review. Persons or groups that originated the idea for the bill may also review it to ensure that the provisions they desire are in the bill in the correct form. 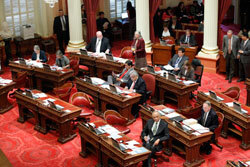 If the author is a Senator, the bill is introduced at the Senate Desk; if an Assemblymember, at the Assembly Desk, where it is assigned a number and read for the first time. 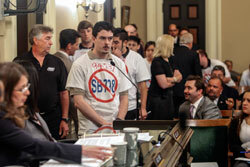 The bill then goes to the Senate or Assembly Rules Committee, where it is assigned to a policy committee. You can find out where your bill is assigned by calling the author. Since bills are not heard in policy committee until 30 days after they have been introduced and printed, there is plenty of time to investigate a bill or contact your legislator to communicate your position on the bill. Each bill must appear in the Daily File for four days prior to being heard in a committee. The Daily File is the agenda of the day’s business, together with public notice of bills set for committee hearings. By checking the File, you can keep track of bills that are being scheduled for committee. If you live out of town and plan to testify at the hearing, it is a good idea to call the author or your legislator to make sure that the bill is going to be heard on that date. Sometimes bills are taken off the agenda at the last moment. At this point, the role of the District Office should be emphasized. District Office staff are there to serve the needs of constituents. They can be extremely helpful in making contacts and getting information from Sacramento. It is a good idea to schedule a meeting with your legislator while he or she is in the district. Communicate your concerns regarding legislation. Indicate that you want to work with the Member’s office on a particular issue. Most bills generate support and opposition from a variety of groups. Find out who these groups or individuals are by calling the author’s office where lists of the letters and phone calls received on each bill are kept. A good strategy is to align yourself with the groups that hold your position and work together to talk to the members of the committee BEFORE the bill is heard. Keep your letters and discussions with the legislators short and to the point. When testifying before the committee, first state your name and the organization that you represent or indicate that you are a concerned citizen and state where you live. The Members of the committee will be interested to hear what you have to say and usually do not grill individual citizens who testify in the same way that they do lobbyists. Keep your testimony short and to the point. Step 3: What If Your Bill Goes To A Fiscal Committee? If the bill has a fiscal impact or a state cost, it will be heard in either the Senate or Assembly Appropriations Committee. At this point, you should inform the Members of the committee why you support or oppose the bill based on a fiscal argument. The finance committees are concerned about fiscal impact and not policy considerations. Try to see the staff analysis that has been done on the bill by the policy committee, the Department of Finance, and/or the Legislative Analyst. Members of the fiscal committees read these analyses before they vote. These analyses are available on the Internet. If you believe that the numbers or the fiscal impact of the bill are not correct as reported in these analyses, you should prepare your written comments before the committee meets. Your written material should be available to pass out to the committee Members at the hearing where you present your testimony. After the bill passes the fiscal committee, it is read for the second time on the Floor. Third Reading is the last stage that a bill goes through in the house of origin before it passes to the second house to go through the committee process all over again. On Third Reading, the author presents the bill for passage by the entire house. Most bills require a majority vote (it must pass by 21 votes in the Senate and 41 votes in the Assembly), while urgency measures and appropriation bills require a two-thirds vote (27 in the Senate, 54 in the Assembly). At any time during the legislative process the bill may be amended, either in committee or on the Floor. After the amendments have been submitted to the author, the bill goes to another printing to reflect the changes that have been made. 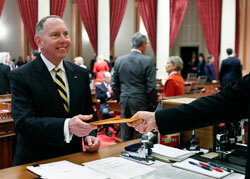 The Senate or Assembly History records the dates when a bill has been amended. Amendments can be substantial or technical and may affect your position on the bill. Amendments should be followed very carefully. Contact with the District Office can be helpful in keeping track of current versions of a bill. If you subscribe to the bill, these amendments will automatically be sent to you. If you change your position on a bill due to a favorable or unfavorable amendment, you should inform the author and your legislator. If a Senate bill is amended by the Assembly, or vice versa, and the house of origin refuses to concur in those amendments, the bill will go to a conference committee. If the house of origin does concur, the bill goes to the Governor. Communicate to your legislator or the author which amendments you prefer and why. The conference committee meetings, particularly at the end of the two-year legislative session, are scheduled quickly and can be easily missed. You must stay in close contact with the author’s staff to stay on top of fast-breaking developments. It is also important to know who will be serving on the conference committee so you can inform them of your position. 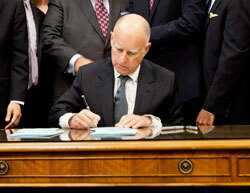 The Governor has 12 days to sign, approve without signing, or veto a bill. A letter or phone call to the Governor’s Office is appropriate to state your position on the bill. If the bill is signed or approved without a signature, it goes to the Secretary of State to be chaptered. If the Governor vetoes the bill, a two-thirds vote in each house is needed to override the veto. The Governor’s Office releases veto messages which explain the veto; these messages are available from the Governor’s Office and on the Internet. A wealth of legislative information is now available on the Internet. You can get bills, amendments, staff analyses, committee agendas, and other legislative information, plus a simple way to track legislation.